I think I’ve mentioned before that Liquid Television was both hugely influential on me and kinda turned out to be an animated version of RAW. And it was Liquid TV where I first saw the work of RAW and, later MAD contributor, Drew Friedman. He had a few “Uncle Louie” shorts, featuring the titular character travelling through the sewers to save on travel expenses. I loved the stippling style of the artwork, the amazingly detailed and photorealistic characters — a mix of the perfectly normal and the strangely grotesque — and the cutout animation. 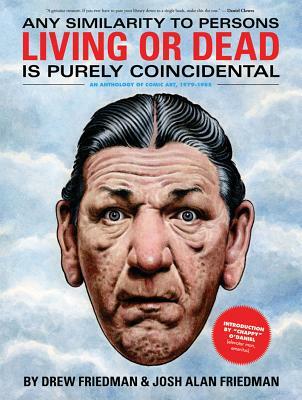 The cover features the amazing portrait of Shemp from — originally published, of all things, as a cover of the pornographic magazine Screw. Shemp acts both as a beacon of Drew Friedman’s amazing artistic skill, but also as a signpost of what you’ll find. Not so much Three Stooges-inspired comedy, but strips starring the semi-forgotten figures of old media. Figures like Abbott & Costello, Chet Huntley, Joe Franklin or Tor Johnson come up frequently. I especially love the Tor strips. And usually, though there’s a surrealist bent like you’d find in the work of Michael Kupperman (Tales Designed To Thrizzle), there’s usually a sense of love for the work of these people. Again, Tor seems to get the most love — there’s a definite sense that the Friedman brothers grew up with Tor’s films and saw them in their natural state (unlike people of my generation who became acquainted with Tor only through Mystery Science Theater 3000). In fact, the only strip that leaves a bad taste in my mouth is “The Lou Costello Jr. Story”, a retelling of the drowning death of Lou Costello’s infant son in a swimming pool written from the point of view of the dead child. It just ends up being kind of ugly, and doesn’t really fit in with the tone of the other strips, which is sometimes light, but even generally the darker ones don’t get quite THAT dark. Of course, too, when that strip was made, pretty much all of the principals were long dead and thus couldn’t care — which does take a bit of the sting out. That’s just a one-page story, and the other stories, also generally between one and two pages, are very strong and worth poring over. Not just for Drew Friedman’s art, but the scripts by Josh Alan Friedman say a lot about how we interact with celebrity and tabloid culture in general. The scripts sometimes have a Confidential! type of feel to them, even when reporting on Jackie “Uncle Fester” Coogan wandering through cemeteries and Joe E. Brown collecting his excrement in a swimming pool. And if none of that grabs you, how can anyone not be swayed by the loveable Tor calling Bela Lugosi after a nightmare to ask him how many Tor. HOW MANY TOR? The Saga of Frank Sinatra Jr.